Hello my lovelies, today I have the very great pleasure to be sharing my review of this wonderful Agatha Christie style mystery; A Testament To Murder by the very talented Viv Conroy, so as we do when settling down to a good old Miss Marple; grab a cuppa and a piece of cake and let me tell you all about this great book. I have been a fan of Ms Conroy’s work for a while now, in fact it is through her work that I re-discovered my love for the marvellous world of cosy mystery. Each book is always full of humour and intrigue and there is always a real sense of a time gone long gone in her writing, but this one has to be the finest she has written it has a real Agatha Christie feel to it, which I found utterly charming. Set during the roaring twenties, this fascinating mystery will have you hooked from the onset. Dying multi-millionaire; Malcolm invites a whole bunch of very distant relatives and employees to his Villa in France. As expected those invited all think that as dear old Malcolm is about to leave this mortal coil that they will be into some money. In a sense they could be right, that is until he reveals is precise dastardly plan for them. He will be changing his will every day at midnight, none knows who he will be leaving his fortune to on any given day. Which leaves Malcolm to sit back and wonder who amongst his guests will bump him off to get their grubby hands on the lot. Amongst sticky fingered and greedy bunch is Scotland Yard Inspector who just happens to be living next door, so when there is a murder he is right on hand to get to the bottom of the case. But with so many people in the frame and so many motive’s can he find the proper killer? This really is a brilliant mystery, it’s original, highly intriguing and intelligently written. It has a real pull to it, that draws you in and keeps you guessing throughout with it’s articulate and twisty plot. Ms Conroy has outdone herself with this one, it is such a joy to read and a wonderful way to spend the afternoon. It is just like settling in for a afternoon of watching Miss Marple of Poirot, it really is that good! There is a real vintage feel about A Testament to Murder that is both highly addictive and hugely comforting, the character’s are colourful and brilliantly created – if at times they are very nasty but utterly engrossing and it is so much fun to see the mystery play out. Highly recommended, whether you like your romance or thriller this will satisfy all. This was an Arc copy from the author via Netgalley in exchange for an honest review, Thank you Viv and apologies for the very late review. A Testament to Murder is available now and can be found at Amazon. This entry was posted in Cosy Mystery, Historical Fiction, Reviews and tagged A Testament To Murder, Canelo, Cosy Mystery, Historical Fiction, Review, Vivian Conroy. Joy Avon’s festive series debut featuring a book-themed tea party organizer will be tons of fun this Christmas for Lorna Barrett and Jenn McKinlay fans. I loved the sound of this when I first heard of it and I definitely was not disappointed, In Peppermint Peril is the first book in the new debut series by Joy Avon and I am looking forward to reading more from this series and author. Callie and her cute and a button dog return to her old childhood hideaway; Hearts Harbour for Christmas, she plans to visit her aunt Iphy who runs one of the best tea rooms I have ever come across, they it is a tea shop that hold and caters for bookish themed events and parties, which is such a brilliant idea. Iphy is a master at these events she tends to know exactly what her customers want and she goes above and beyond to cater for them. While staying with her aunt Callie and Iphy are preparing for an Agatha Christie themed event at Haywood Hall. The owner of the Hall; 93 year old Dorothea has decided to make adjustments to her will but as with the stories of the great Agatha Christie her self thing’s don’t exactly go to plan. As the family and friends of the hugely wealthy Dorothea all flock to the Hall to see what if anything is in store for them, which is all very well the only thing is that none of them like each other, in fact dislike is a mild term what this family feels for one and other. To add to the not so happy get-together Callie’s child hood friends adds a bit more fuel to the fire in the form of her wanting to steal the lime light in announcing her daughters engagement, which isn’t the happy news that she would have hoped. Then right in the middle of so much hype and animosity somebody is murdered with Callie right in the middle of the investigation. I love that this has got a real Poirot or Miss Marple feel to it, the murder mystery is brilliantly paced the reader follows Callie and the investigation right up to finally uncovering who the murderer was. Even though this is a contemporary story, for me it has a proper vintage feel to it, it’s cosy and fun and brilliantly engrossing. The writing is clearly stylish, it flows with a rare ease and keeps the readers turning the pages. Callie is a brilliant character she is a genuinely lovely lady who is a pretty damn good investigator – definitely a young Miss Marple in the making. On top of the whole murder mystery you have a jolly good Christmas read that will fill you with festive cheer and it is perfect for these cold and cosy long nights. This was an ARC via the publisher from Netgalley. In Peppermint Peril is to be released on 13th November and can be pre-ordered at Amazon. This entry was posted in ARC, Christmas, Cosy Mystery, Reviews and tagged A Tea and a Read Mystery Series, ARC, Christmas, Contemporary, Cosy Mystery, Crooked Lane Books, In Peppermint Peril, Joy Avon, Review. The perfect cosy crime bundle, featuring all three Country Gift Shop mysteries. Glen Cove is a rather murderous place. Vicky Simmons is looking for the simple life. She’s ready to trade in London for a slower pace by opening a British Country Gift Shop in her old hometown on the coast of Maine. All is looking rosy until Vicky finds herself face-to-face with a dead body and Michael is the prime suspect. When the sheriff links the motive for murder to the unsolved disappearance of a teenage girl twenty years ago, Vicky must turn amateur sleuth. She’ll stop at nothing to save Michael…and unmask the real killer! Inviting the bestselling cozy crime author Bella Brookes to town is going to be the best business move Vicky Simmons has made yet. Not only is Bella going to sign her books to kick off Glen Cove’s annual One-Mile Book Market, but she’s also running her famous scavenger hunt right in town. That’s sure to win over the townsfolk! All is going to plan until a dead body is discovered, drawing Vicky straight to the scene of the crime. After the last murder Vicky had vowed to stay out of Sheriff Cash’s way, but when death comes to town she finds herself embroiled in the investigation. Vicky Simmons’s life was supposed to be relaxing after she moved back home to the coast of Maine, but instead of baking bread and gardening she’s been chasing down killers and it’s time to stop. Vicky is ready to slow down again and vows to start focusing more on her roses than solving crime. This entry was posted in Cosy Mystery, Cover Reveal, Exclusives and tagged Cosy Mystery, Cover Reveal, Exclusive, Vivian Conroy. In an attempt to safeguard evidence to prove his innocence, Merula almost gets killed but for the timely interference of enigmatic Lord Raven Royston. Viewing natural history as a last resort to regain respectability lost by too many dubious business investments, Raven didn’t expect his first lecture to take a murderous turn. Feeling partially responsible because he encouraged Merula to release the gigantic butterfly from the glass case in which it was kept, Raven suggests they solve the puzzle of Lady Sophia’s sudden death together by looking closer at her relations with estranged friends, long suffering staff and the man groomed to be her heir, so close to her money and yet unable to touch any of it. 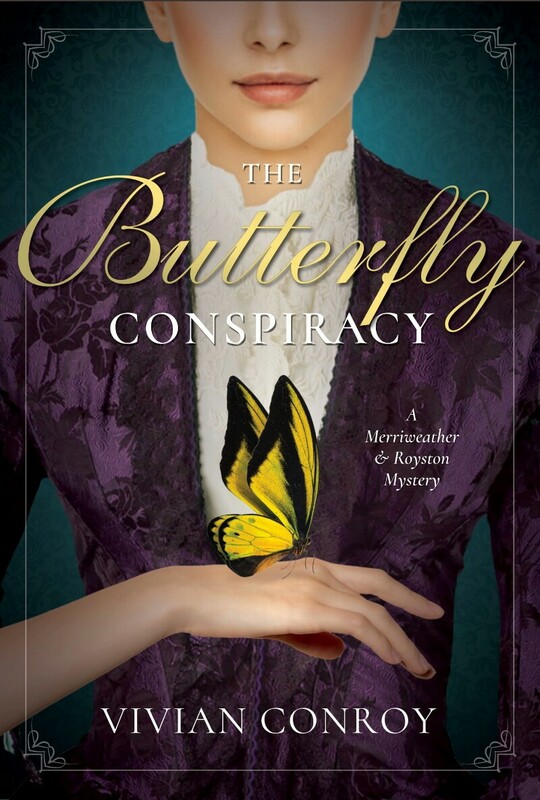 With the police looking for them, and every new discovery raising more questions than answers, especially about the murder method which left no traces of foul play on the body, Merula will have to risk her own life to get at the truth and save her uncle from the gallows in The Butterfly Conspiracy, Vivian Conroy’s enchanting series debut. I am a huge fan of Ms Conroy’s Cosy Mysteries for a while now, they are stylish, intriguing and fun to read and when I heard about this new Victorian set series I couldn’t wait to get my sticky fingers on it. I have been avidly awaiting this book for ages and this is just so good, with a feel of Sherlock Holmes this is a fantastic start to what I know is going to be an intriguing and fabulous series. Set during the dark and somewhat forward-thinking Victorian era – I do love this era! 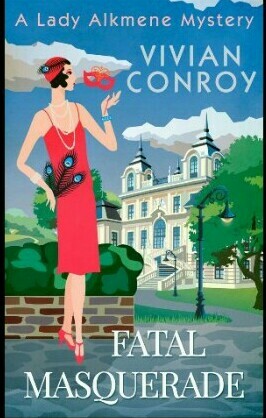 After reading her twenties set, Lady Alkmene series, I have been eager to see what Ms Conroy does with one of my favorite era’s and I have to say that she has taken the Cosy Mystery genre and this era and stamped her name all over it. I was hooked from the onset, the spidery web of intrigue that Ms Conroy has woven, is clever and immersive. Merula Merriweather would rather be tucked away in her conservatory, tending to her exotic Butterflies which she is hatching or learning the newest in Zoological research. She isn’t bothered about balls and fashion’s or even finding a husband like her cousin, she is a breath of fresh air and definitely a character that women can relate to. Merula has just gone and hatched one of the rarest butterflies in the world and she is eager to show it off to the Zoological society and prove that yes it does exist but as she is a woman in the Victorian era she isn’t allowed so she shows her work under her uncle Rupert’s name. After being raised by her aunt and uncle since a baby, due to scandalous beginnings her uncle has always treated her just like a daughter. I really like Rupert he has always encouraged her thirst for knowledge and aided her research and interest’s, I think he too finds her unselfish personality and need to learn and prove what she believes in, to be a rare and beautiful thing and he is always willing to help her in any way he can just as he does with his more stereotypical society daughter. Merula takes her newly hatched Butterfly along to the Zoological society’s meeting to show it, to say that Merula is excited is an understatement. Once there she meets we meet some of the most interesting people, they really are a mixed bunch and one of their number is the mysterious and rakish Lord Raven Royston – don’t you love that name? It while there that everything goes wrong for Merula, and one thing leads to another and the night is ruined by the murder of a Lady Sophia but more than that her Uncle Rupert has been accused of the murder. It is at this point that the wonderfully dynamic Raven and intelligent but naive Merula have to join forces to try to solve the murder. This is just the start of what I hope is to be an on going series, these two are brilliant together. They work so well their different personalities bounce off one and other and yet they come together and create this great partnership. I like the fact that there is a hint of a romance between them, it is only a tiniest little thing, but it opens up their story of what could be. I like how Conroy has done that, it makes you wonder but doesn’t take any attention away from the actual story. It starts off like a regular historical we meet the leading lady, who I thought to be a wonderful and clever lady who is way before her time. Literally she is thinking decades ahead. Then we meet irresistible and charming Raven, he’s great protective and so sure of himself, but he’s got a real soft heart. Once we have left the confines of the house and we delve into the murky world of murder this story becomes something else, capturing your attention. It keeps hold of you throughout the twisty plot until it reaches the climatic end. If you love reading the likes of Arthur Conan Doyle’s most famous detective; Sherlock Holmes then this is definitely right up your street, in fact by reading this I am keen to read some Sherlock Holmes myself. This is just fabulous, Vivian Conroy can do no wrong for me, but this is by far her best work to date, I absolutely loved it! The Butterfly Conspiracy is to be release 7th August and can be pre-ordered now at Amazon. This entry was posted in ARC, Cosy Mystery, Reviews and tagged A Merriweather and Ryston Mystery, ARC, Cosy Mystery, Crooked Lane Books, Review, The Butterfly Conspiracy, Vivian Conroy. Lady Alkmene Callender has always loved grand parties, but when she receives an invitation to a masked ball thrown by Franklin Hargrove– oil magnate, aviation enthusiast and father of her best friend, Denise– she’s never seen such luxury. The estate is lit up with Chinese lanterns in the gardens, boats operated by footmen float across the pond and the guest list features the distinguished, rich and powerful! Book four in the Lady Alkmene Mysteries sees our lady sleuth invited to a masquerade party at the home of the wealthy Franklin Hargrove as soon as she steps through the front door it is instantly clear that there is something very wrong with the household which intrigues our Alkmene and when journalist Jake Dubois turns up under the pretence of writing a story about the lords new foray into motor engines she knows that something is amiss. Why would Jack be there just to write a story about a motor engine? Especially as Jack has unashamedly can’t stand the aristocracy and he too is acting rather secretive. With the Masquerade party in full swing Alkmene being her usual some what nosey self, but not surprising with this odd bunch of people who all have secrets she needs to find out. There is the very unsettling psychiatrist Theobald Zeilovsky and his wife who tend to turn up in the most unexpected places, the acid tongued Mrs Hargrove who is keeping secrets and threatening any one who gets too close, aunt Felicia who seems too jumpy whenever the Steeplechase case is mentioned, but why? Then there is the odd behavior of a particular footman. Cobb caught her eye right from the moment she stepped through the doors, what is it about him that put our lady sleuth on edge? But it’s not just the other household guests and servants that we acting odd, so is Jake, why is he there? Jake put the notebook in his pocket and extracted a black silk mask. He made a face at her before slipping it on. It transformed him from a handsome man in a tuxedo into an intriguing rogue…. With all of this swirling through her head she isn’t expecting to find the murdered body of none other than the odd footman Cobb and for her to have the finger pointed at for it! But who really stuck the knife in? There seems to be an endless list of people who have a reason for wanting the cocky footman dead, was it a member of the Masquerade? As usual our Lady sleuth and her faithful handsome journalist set out to uncover the truth but what they find is shocking and disturbing and leads to quite an unexpected ending. Just like with book one; A Proposal to Die For, the atmosphere between Jake and Alkmene crackles. There is something there between these two, from the little looks and the thoughts that crosses Alkmene’s mind right at the end, you know that there something must happen. There is a blossoming romance between them and I hope that if we get a fifth instalment that Jake and Alkmene finally get the chance to give it a go. ‘You will be careful, won’t you?’ Alkmene’s heart was beating fast, and she suddenly felt there were so many things she’d wanted to say to Jake, but never had. Now she might never get another chance….. I love the cliff hanger ending, if it were a TV show it would freeze frame on our Jake Dubois with “To be continued…” running along the bottom of shot, Ms Conroy has left book four in such a place that there must be another episode, we need to know the answers to the questions that circulate the last scene. I thoroughly enjoy this series, its like being transported to another, more glamorous and deadly time. With twists and unexpected turns Fatal Masquerade keeps you hooked from page one to the very last and beyond as you are still wondering where we are going from here. The writing is riveting and charming especially Alkmene and Jake who are still fun and engrossing. Another winner and highly recommended. This was an ARC via the author in exchange for an honest review. Fatal Masquerade is out today and can be purchased from Amazon. This entry was posted in ARC, Blog Tour, Cosy Mystery, Reviews and tagged ARC, Fatal Masquerade, HQ Digital UK, Lady Alkmene Cosy Mystery, Review, Vivian Conroy. This is book one in the Lady Alkmene Mysteries and the first time I have read Ms Conroy and I love it, her writing is fresh and entertaining, it’s like an episode of Miss Fisher Murder Mysteries sprinkled with what I can only describe as a good old-fashioned Miss Marple. With her father, out of the country until at least Christmas, Lady Alkmene has the freedom to do as she pleases the only problem is she bored with the usual amusements. She goes to all the functions, parties and the theatre and yet it’s the same over and over again, she wants something else to occupy her days. The answer to her prayers comes when at a party she unintentionally over hears an intriguing conversation between the beautiful American Evelyn Steinbeck and a mysterious man. They are discussing being together and eloping but Ms Steinbeck is more worried about money and living the life that she has become accustomed to and she is also worried about what her wealthy uncle will think especially as she is his sole heir. Alkmene is intrigued especially as mere days after she had heard their conversation Mr Silas Norwhich, the uncle to Evenlyn Steinbeck, is found dead in his home. Well, obviously Alkmene thinks that this is highly suspicious, her over active and intelligent mind starts turning as she is caught up in the moment and the thrill of the case. This is just thing that she needs, it’s too good to pass up so, she decides to do a bit of digging. She knows that there is something not quite right about all of this, it’s just too much of a coincidence and more than that she is feeling excited about something. Unexpected death always had an unhealthy appeal to Alkmene, and she perused the few lines underneath with great interest…..
On the first day of her case she meets charismatic, handsome and often gruff journalist Jack Dubois – who like her sees something more to this man’s death – soon team up and start to investigate together, but not before a few mishaps and her irritating him so much he can’t refuse her.Things don’t go as smoothly as Alkmene had originally thought as she and Jack find themselves deep into something that proves to be very dangerous, and things get tangled and confused with blackmailers and stolen precious heirlooms and there is something very fishy about Evelyn and her strange visitor. Could she be in on her uncle’s murder? It’s slick our leads just ooze sophisticated glamour of the era, Jack and Alkmene despite their difference in stations they make a great team. Alkmene is your stereotypical aristocrat, she has lived her entire life in the glitz and glamour and she really has no idea of how life is beyond her front door. Like a lot of aristocratic ladies of the time, she is spoilt and naive and too wrapped in cotton wool to be able to do anything for themselves – it is highly amusing when she attempts to launder Jack’s handkerchief and she makes a right pigs ear of it. Whereas Jack Dubois is a man of the world who has many skeletons in his closet that he is determined to keep well hidden, Monsieur Dubois has a certain Gaelic charm mixed with his slightly rough around the edge aura and you have a highly attractive and intriguing man. Between them they can get any information they want, have access to any home or authority as they both have connections in very different places which only aids their case. Now this man made it sound like a crime that she didn’t know how to get this handkerchief cleaned up herself. Probably a communist dead set against English aristocracy…..
What I really like about this though is the relationship between Jack and Alkmene, they are as different as you can get, her being a sophisticated aristocrat and him a rough ex-convict and yet they find a common interest and they do rub along rather well. A Proposal to Die for is a none taxing and cosy “who dunnit” which is thrilling, witty and oozes old school glamour. It is one of those books that can be read by any one, not matter what genre you favour this is very good and I very much recommend it. 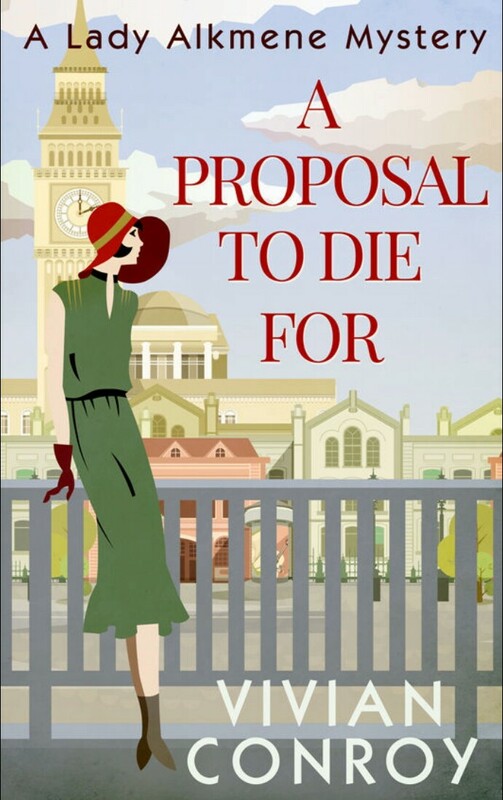 A Proposal to Die for can be purchased at Amazon. This entry was posted in Blog Tour, Complimentary copy, Cosy Mystery, Reviews and tagged A Proposal to Die For, Blog Tour, Lady Alkmene Cosy Mystery, Review, Vivian Conroy.